The Gawai Special Package is for those who wish to experience authentic Gawai celebration; where you must venture to a Dayak longhouse and join in the festival activities of the people. This is the most common advice to all those who are new to Sarawak’s Gawai celebration which falls on 1st & 2nd June annually here. Gawai is actually a social and religious festival of the Dayaks, comprising mainly of Iban and Bidayuh native tribes as Thanksgiving Day marking bountiful rice harvest and for plans and activities for the next planting season. Jointly organized by Ministry of Tourism Sarawak, Tourism Malaysia, Sarawak Tourism Board and Sarawak Cultural Village, the package is one unique experience for all participants in a unique and conducive environment. Living in the Sarawak Cultural Village is itself a memorable experience as the village is a representative collection of Sarawak’s various ethnic groups’ traditional homes. Located at the foothills of Mount Santubong, the award winning village is surrounded by forest, river and just a short drive from the capital city, Kuching. The package was launched by Minister of Tourism Datuk Amar Abang Johari Tun Openg on 18 of May 2012, and said in his speech that the package will be available from now until 30 June 2012. He added that the package will be an invaluable experience for tourists. About 40 members of the media and travel agents from Sabah and East Malaysia, were present during the launching and they had the chance to visit Kubah National Park, Matang Wildlife National Park, Semonggoh Wildlife Nature Reserve. They had a pleasure of cycling around the city too organised by Tourism Malaysia to have a feel prior to the Kuching Bike Ride event on 27th of May, 2012. They spent a night in Sarawak Cultural Village to experience what the package is all about and to join the celebration of the event on Friday. Then they spent two nights at 360 Urban Resort and went home on Monday. Datin Amar Ju’maini Tun Bujang was also present including Malaysia Tourism Promotion Board state director Ahmad Johanif, Sarawak Cultural Village General Manager Jane Lian Labang, and Assistant Minister of Tourism Datuk Talib Zulpilip, and members of the media and invited guests. Aband Johari is confident that the package would help increase foreign tourists arrivals even if Sarawak was facing some flight route issues. He added that this month was the busiest for Sarawak Cultural Village as many visitors wanted to experience Gawai for themselves, and join in on the World Harvest Festival later this month. Upon arrival at Sarawak Cultural Village, guests and participants will join in the ‘Pun Ramyai’, ‘Miring’ led by a ‘Lemambang’ and a toast of ‘Ai Pengayu’. Pun Ramyai is a Tree of Fortune which signifies the fortune of the people for the upcoming celebration and Miring is a customary offering ceremony to mark many activities of the villagers. Lemambang refers to the poem chanter prior to the start of many activities and Ai Pengayu is the rice wine served during the ceremony to signify long life. All these activities are carried out in a merry making celebration participated by the villagers and so guests will also be invited to join in. Following a host of other interesting activities, all the Special Gawai Package participants will go on a short jungle trekking at the Mount Santubong foothills where they have the opportunity to catch sight of monkeys, lizards, and fascinating pitcher plants to tall imposing trees. That short outdoor excursion served the best reason for a relaxing session in the Sarawak Cultural Village theater where cultural performances featuring various ethnic dances will be held. The evening dinner is an eagerly anticipated affair as participants assigned to different groups will be preparing dishes for the dinner. This ‘Do-it-yourself’ collective effort is called “Berapi Kitai” and participants learn first-hand the preparation and cooking of traditional recipes of the ethnic groups. Following dinner, the most interesting event then unfolds, “Makai Begulai” where participants watch and learn from the traditional dance experts the intricate steps of the dances. The merry dancing is always a challenge to visitors as they try to imitate their hosts’ nimble steps and body twists as well as learning to strike the gongs at the rhythmic paces. Before retiring for the night, participants will all symbolically roll up the mats on the floor to symbolise the end of the night’s celebration. Known as “Ngling Tikai” it provides a fitting end to a wonderful sharing of cultures and traditions between the people. Breakfast the next morning is an interesting selection of Orang Ulu fares. “Mirup Lekadchang” or breakfast will be an opportunity for the participants to sample some Orang Ulu food in the village. On a later part of the morning, the participants will once again get their hands into making traditional Iban biscuits using local ingredients. Commonly referred to as “Ngadu Penganan” the biscuit making experience gives guests an insight into the simple exercise of making tasty biscuits. Lunch comes next and it will feature Bidayuh food selections. Expertly prepared by the senior Bidayuh mothers, “Netas Pun Ranyai” also marks the end of the wonderful experience of the participants in the Special Gawai Package at the Sarawak Cultural Village. Depending on the choice, the special package is priced at RM399.00 per pax for 2-days 1 night stay while the RM499.00 (3-days 2 nights) and RM599.00 (4-days 3 nights) are also available. This inaugural launch of the special package is certainly going to attract record number of participants so book early to avoid disappointment. Any inquiries that you have regarding the package you can e-mail to Ask@SarawakBorneoTour.com or browse through at www.SarawakBorneoTour.com. The World Harvest Festival 2012 is one of the highlights of the Gawai Dayak celebrations which is an ethnic festival. This will be its eighth year and is organised at the Sarawak Cultural Village from 26th to 27th May 2012, it also helps to bring both locals and foreigners together to experience the true Sarawak culture. World Harvest Festival 2012 is not only synonymous with the festivities of the Dayak, but has come to encompass other ethnic groups in Sarawak as well as the tourists, to help reflect the true Malaysian spirit of the people. The World Harvest Festival 2012 was introduced in line with Ministry of Tourism Sarawak’s objective to position it as an international event on its tourism calendar. The World Harvest Festival 2012 provides the opportunity for the non–Dayak to understand the cultures, traditions and aspirations of the Dayak community. The awareness and interest created by the festival promises to benefit both the public sector and tourism industry. Among the many highlights of the World Harvest Festival 2012 cultural event is the theme play held on May 26th, 2012. “Selanting Kuning & the Dragon King”, based on the Bidayuh legend was featured last year and this year it will be on the Iban legend entitled “The Adventures of Keling & Kumang”. What is unique about this theme play is that the whole Village becomes the stage, and the entire play promises to overwhelm the guests in audio and visual splendour. Another highlight to capture the festival and mood of the guests is the ethnic beauty pageant “Miss World Harvest Festival 2012”. This beauty pageant revolves around the Iban community theme. Fifteen beauties will vie for the coveted title this year, which never fails to add colour and vibrancy to the festival. The proud winner last year was Miss Suljirina Lucas, 27 years old Berawan lass. As always the Harvest Festival or Gawai is celebrated on a grander scale with the participation of cultural troupes from other countries. This is evident in the International Cultural Extravaganza, with day time workshops. This year our friends from Indonesia and Selangor will be joining the festivities. A series of joint workshop by the locals and the invited troupes will be held during the 2 days festival. This is the ideal time for the visitors to have the opportunity to learn about each community’s traditions, foods and handicrafts. For those who want to prove their manly prowess, there is the Ironman World Harvest Festival 2012 competition. This is another highlight in the festival that involves 15 finalists who exhibit ‘superhuman’ strength in tackling the traditional based activities like blowpipe shooting, coconut dehusking, 50kg gunny rice lifting, wood chopping and mountain climbing. Last year, Encik Amir Hanafi emerged as the champion. The WHF promises to be the fun-filled event for the young and old. Bring along your loved ones and make this an affair to remember. What awaits you is a cultural extravaganza like no other. Tickets are on sale for RM60.00 per person (adults) and RM30.00 for children (age 6 - 12 years old) at the Sarawak Cultural Village. Any inquiries that you have regarding the event you can e-mail to Ask@SarawakBorneoTour.com or browse through our interesting packages at www.SarawakBorneoTour.com. The most famous orang utan in Sarawak, Borneo will be Ritchie. Ritchie is the oldest living male orang utan in Semenggoh Orang Utan Rehabilitation here in Sarawak, Borneo. Born in 1981, Ritchie is now 31 years-old and weighs about 31 kilos. Orang utans are a species of great ape found only in South East Asia on the islands of Borneo and Sumatra, although evidence of their existence has been found in Java, Vietnam and China. The gentle red ape demonstrates significant intelligence, with ability to reason and think and is one of our closest relatives, sharing 97% of the same DNA as humans. Ritchie is the dominant alpha male of the pack, and he is like the king of the jungle here at the Semenggoh Orang Utan Rehabilitation. He rarely makes an appearance in front of tourists who come and visit the centre, so it is sometime really hard that we get to see him around. He's very active among the orang utans in the centre, and said to have very strong arms where he swings from tree to tree. Ritchie is said to be very smart where he was seen to open a coconut by himself, drinking the coconut juice first before opening up the coconut shell to eat the pulp. His favourite foods are fruits and coconuts. Every time when Ritchie makes an appearance, the orang utans will keep their distance from him, as Ritchie is known to be aggressive against other orang utans. It was said that he once got into a fight with a fellow male orang utan named George in the centre. 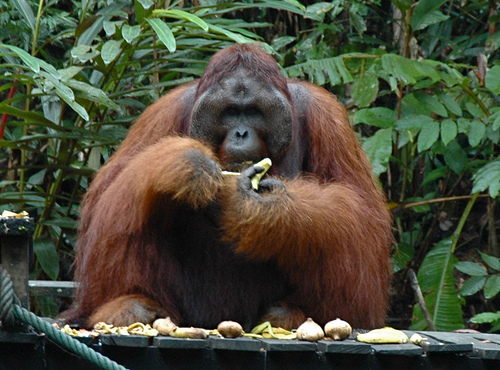 George was moved out from Semenggoh and was placed at Matang Wildlife Centre. So if you guys are interested in seeing orang utans in their natural surroundings, Semenggoh Orang Utan Rehabilitation will be a good choice. Semenggoh Orang Utan Rehabilitation Centre is undoubtedly one of the best attractions in the Kuching area. It offers the opportunity of getting close to some highly mischievous, semi-wild Orang Utan. Semenggoh became the first forest reserve in Sarawak in 1920. It was turned into a wild life rehabilitation centre for monkeys, Orang Utans, honey bears and hornbills in 1975. The aim is to reintroduce as many of the animals as possible to their natural habitat, as many had been orphaned by logging or were being illegally kept as pets. There is more to see in the morning as the young monkeys and Orang Utans are put back in their cages at 3pm. The best time to visit Semenggoh is during feeding time, which takes place between 8.30-9am and 3-3.30 pm. Go to www.SarawakBorneoTour.com for more info or e-mail us at Ask@SarawakBorneoTour.com for any inquiries.